OK. Lets start. First lets find out which SharePoint Web Control belongs to which data type in SharePoint. So how do we use these controls? The answer to this question is simple: Just use them like "normal" System.Web Controls. In this case the RichTextField shows the content from the "MultilineRichText" field from our list, and our listitem in the Editmode. ID and FieldName are the Displayname from our field. You have to set the List, Item and FieldName for the Control, because usually the SharePoint Controls will use the SPContext content (remember: the controls are used in the editform, newform.. pages of every SharePoint List). Instead of finding a specific control for each SPField, you can use the BaseFieldControl. The advantage is, that it doesn’t matter which field you want to render. The right control will be used. I have updated my class to use the generic instead of finding the matching Webcontrol. This approach makes it easier to use MOSS controls. You don’t have to distinct between WSS and MOSS controls any more. You can Download the RH.SharePoint.SharePointWebControls class here. I updated my SharePointWebControls. This version includes a seperate file, which handels publishing controls from the Microsoft Office SharePoint Server 2007. The class not uses a generic control instead of a control for each field type. You have to bind the Control to a list. Otherwise it does not know “what to do”. What do you want to do with the control if you don’t want to save a listitem? is there any other way to add “formatted text editor” to webpart? I guess you could bind the control to a list, and add a custom button which sends the email. You can read the content of the control without sending it to a (new) listitem. just want to thank you for this post, I spent a lot of time looking after this solution, but finally! I want create a custom newform/editform for a list based on a view. I’ve created a custom listpicker toolpart allowing me to choose the list and view I want to base the form on. I didn’t post the entire error as it seems unnecessary. Do you know why I can’t access fields outside the current site? I never tried to access a list from a different site. But since you can specify the listId and the itemId from an element to be used for the controls, I guess accessing a list from another site might not be possible. The web property is readonly. How to use these controls to edit and update an item ? 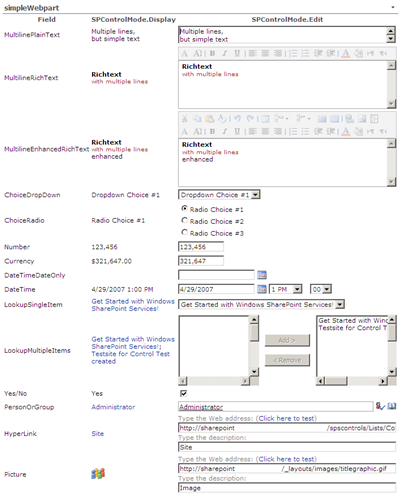 I am using RH.SharePoint in my project but I have some trouble. But when I try to update my Item by a button_click, I have an error with this message “unexpected error”. I think my postback event is the probleme but I don’t know how to solve it. Do you know why I have this error or, do you have a sample code where you are using these controls to edit and update an item. sry that I get back to you so late. I was sick. The problem you are experiencing, is because you have 2 controls with the same ID. Your table uses the field.Title as ID, as well as my SharePoint Control. You could set the table.ID like field.Title+”_Table”; or something like that. I created forms during a project last autumn with a similar approach, but using the general control “FormField” for all kinds of fields. I am now in a new project where I need this kind of functionality, so I tried my old method again. Even though all webcontrols render properly using FormField, they do not all seem to function as intended (for instance, the verify user in people picker does not work). Tried your method, and everything seems to be working. Excellent post, thank you! I do have one question though, how do you update your listitems? In my last project, my webpart was in the context of the list (EditForm.aspx), so I just used SPContext.Current.ListItem.Update() (the field controls seem to be databound somehow) in my event handler. In this project, I am trying to remotely update listitems from my webpart (the webpart is not running in the context of the list). Any idea on how to do this except iterating all fieldcontrols and transfering their new values to the listitem? >Any idea on how to do this except iterating all fieldcontrols and transfering their new values to the listitem? I am afraid no 🙁 But if you find a way, let me know. Iterating the fields turned out to be a pretty smooth solution, so I’m sticking with it for now. I’ve run into some security issues though. I am creating a webpart which accesses a list that the user doesn’t have permission to access (grabbing items using OM and elevated privileges). However, when I load the webpart using an account that does not have access to the list, I am denied access. I’m guessing that the Security framework checks the bound listitem for permissions before rendering the page. You have to create your SPList… within the elevated method. Otherwise you try to modify an object, where you don’t have access to. The List exists at the top-level site. If I call this page from the top-level site then it works. If I call this page from anywhere else, I get an error message! I’m using your .cs file to create my controls and to retrieve there values. But i notice your use the field.title to set the control ID. In my code, I use some field.title like “Date d’analyse” or “Date d’émission” and with your code I have some id problème. I suggest your change your code to use the field.id to set the control.ID. thanks a lot for this article and for the supportof users. I hope this comment is useful for you. thx. I will look into this, and update my cs. using ur code (which was very helpful, btw) i somehow cant show the title field, which is a computedfield. do yo have any idea what might cause the problem>? what is your formula for your title field? I did not see the behaviour you mentioned. i am very much new to SharePoint. when I am back from my holliday, I will update my control.cs. OK? So look back at this page in October. My Error is exactly similar to the one posted above..
As mentioned in the post above, my list is present in a subsite & I am accessing it from a top level site. However, I have the ListID & the subsiteID to open the required list. Once I get the reference to the list & its view, I am doing the same process of iterating through the Fields & creating the controls. Also I am using ElevatedPrivileges to open the site/web/list/view. In display mode it is fine, but edit mode, it throws the above error. In fact it goes through the child controls method but fails after that. How to create new record in list using RH class. I want to create a web part for adding new records in a list. i want to use sharepoint people picker and sharepoint datetime picker on the web part. using submit button data will be added to a list. How i will achive this. Operation is not valid due to the current state of the object! If you want to modify a list by using this webpart it only works if the list lies on the same “level” as the webpart itself. Has anyone found a solution for this, or does it simply not work? Re: How to create new record in list using RH class. I think you will get an impression on how to “work” with SharePoint Controls. I am building web parts that address a separate, relational database. I can get SPGridView to address this database and display data, and I could certainly use regular ASP.NET controls for text, button, and so on. However, I would like to use Sharepoint controls (such as those you list at the top of this blog entry) as they are linked to the Sharepoint CSS. The few attempts I have made so far are all throwing the error “Operation is not valid due to the current state of the object” since I am not tying these controls to a List. Is there a DIFFERENT set of Sharepoint controls that are not directly dependent on a Sharepoint List? Or should I simply use regular ASP.NET controls, and attempt to point the CssClass property at items in Core.css? 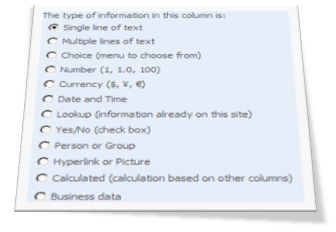 the name “SharePoint” Controls means, you have to use them in SharePoint Context, with SharePoint data. But you can create a dummy list, with the fields you need in the site where you want to Webpart to be. Then create a new SPListItem with SPListItem item = list.Items.Add(). You don’t need to save it later on. Just read the values the user filled in. I am using your CS class to generate a custom ASPX page which actually maps to any List Item (passing in the WebUrl, ListID and ItemID through the URL). It can them mimick the edit page of the list from anywhere in sharepoint (so you can provide a page from anywhere in SharePoint to edit items anywhere else in SharePoint). Everything works just fine .. but the RichTextField control is always returning “” as the Value or Text properties. Doesn’t matter how much text I throw into the control .. it always shows blank div tags. It works ok. Bu if I add attribute: DateOnly=”true”, I got System.NullReferenceException. It looks like bug in SharePoint’s object model. Have you any ideas how to work around it? >Have you any ideas how to work around it? Sry. I don’t. But I hope the SP1 will be out soon. Hopefully your problem will be solved than. Is data I enter to Control is posted to Field? I create a custom page, where use Field to Control “transformation”. But when I press “Submit” button the entered data does not updates, next time, I open edit page, I get the same old data in controls. Do I have to save all that data, by myself? Or there is somesort of automatic data storage? If I must update data by myself, maybe you can tell me easiest way how can this be done? RE: Is data I enter to Control is posted to Field? What is a Field Control “transformation”? And yes, you have to save all data, if you use custom controls. You could take a look at some of my Webparts to get the feeling for the Controls. You can find them in the download library on the front page. RE: RE: Is data I enter to Control is posted to Field? But I still dont understand how can I save data from control? There is no “Value” field not in Control, not in SpField? I associate a datetimefiel controlæ to my pagelayout. I set the Date column to display todays date, but when I edit the new page the date does not appear. Any Idea??? Could you post your code fragment, so I can look at it? Finally solved the problem of using sharepoint webcontrols from a different site. First of all, we should have the id for the item which we would like to edit or view. The id for the list of the item, the web, where the list exists, and the name of the field. Then create the webcontrol and set the appropriate properties. I’m having some problem with the UserField control. When I use the control the “Check name” and “Browse” buttons does not work. Has anyone had similar experience??? Thx for your post! Awesome! I used your CS class to create my form and added a Button to save the new item. On the Click Event I do SPContext.Current.ListItem.Update(); to update the database. (Work fine)…But how to change the redirection page after that? How to catch TRUE/FALSE on the form validation? How to redirect the user if the update was succesful? The problem was that publishing fields error on “field.FieldRenderingControl” (publishing fields do not support it) so I had to get around that by using “field.TypeAsString”. It’s a bit of a hack. I also had to add a reference to “Microsoft.SharePoint.Publishing.WebControls”. Has anyone else found a better solution to this? I try to make a custom webpart to add a new event to a calendar list but have problems with the alldayevent and the recurrencefield with your class. Is there any field that I have link to these fields or any other solution? I have identified the problem, and will release a new version soon. you can redirect using “SPUtility.Redirect”. What do you mean with “catch TRUE/FALSE”? Do you mean if all entries are valid? If so, you can use “Page.IsValid”. I have never thought about publishing fields. I will look into this, thx for your codesample! Any progress on the userfield control issue or a hint as to what is causing the problem. Thanks you and as said before this is awesome. I am close. The problem was/is that the ID of the control was not set alright. Meaning it was too long. For a quick solution, set the ID to a short value like “FieldUser1”. Like I said before thank you so much for this post. I wouldn’t have known where to begin if not for this post. I hope this will help some. I changed your code some when I ran into an error with the Multiple lookup field. I changed all the ID’s to be field.Title instead of field.ID. This did not fix the UserField however. I have just changed them to field.InternalName and all is working perfectly. Could you please let me know if you resolved the problem of Recurrence control. I am having problem in Calendar list while rendering these contols. some fields require interaction between them. e.g. the allday checkbox disables the time from start/end dates. as long as I use the Edit mode, everything goes fine. When I set mode to Display, I got the default values of each field set at the creation of the list. Text and Value, in TextField for example, are empty. I don’t know why, do you have any idea? Thanks. my guess would be that you did not set the context. Did you set the list, item and field which the control belongs too? Thanks René, I solved my last problem “Mode.Display problem”. I got the DropDownChoiceField and CheckBoxChoiceField Control doesn’t get their data after a postback event. I don’t understand why. I will try now with a standard ListBox Control. Ok I found the problem for this type of fields!! And it work fine. It’s was not working for checkbox too, and now it’s working. I didn’t really test the other types who use ItemFieldValue propeertie, but I think it’s the same problem. RichTextBox , only renders as regular text box. Well there you have it my RTF renders only as a TF. on the default.aspx page, all mode works, but on others pages, the display mode don’t work, and render [“Column Title” column value] instead of the field value. I am trying to set CheckBoxChoiceField with certain values to render out onto page. Any ideas how I can achieve this? I have tried setting CheckBoxChoiceField.Value and CheckBoxChoiceField.ItemFieldValue without success. Can you give me an example how I can set these fields with values? Can please tell me what should i do if i want to save the changes (in edit mode) back to the list item and if i want to create a new item (in new mode)? A code snippet would be helpful. How to set the value of the RichTextField. I am using a RichTextFiled to enter values in to a List. It works fine while adding new Item… but When I tried to populate the RichTextFiled from the List Item it shows blank. Is it possible not to specify ListID? If I have a site column and a content type containing this column it should be enough for distinguishing what web control to use, it’s default values etc. Good question. A content type is associated with a list. So I would think, that you have to use a listid. Hi, using your code which is great, but I cannot make the user field work properly in a Web Part in vs 2008. The lookup icon works, but when you click on the check user icon I get The target ‘ctl00$m$g_eb90ff9d_b5e4_4348_aa17_cccb1b44169e$Field_AssignedTo$ctl00$UserField’ for the callback could not be found or did not implement ICallbackEventHandler. Hi, I’ve found a way around my problem. I have a web part with list boxes on it to choose a content type. When the user changes the content type, I display the content type fields through the ddl_SelectedIndexChanged event. All the fields display correctly,but I get the error with user fields. I’ve got around this by redirecting the current page with a query string to tell it the values posted (rather than view state), and then placing the fields on the screen. Its not ideal but it works! Anyone tell me why? Usually this kind of problem occurs if not all base methods are called. In your Render(Contents), what do you do there. Just render a control which holds your userfield, or base.Render? Rene, thanks for the response, but I am not sure where I should be amending the code to use the context. I guess its somewhere on the control, but I cannot see anything like a spcontext property. Can you confirm what you mean please? Just search on this page for SPContext. You will find a comment (13.01.2008 19:34). Failed to render “columnname” column because of an error in the “Single line of text” field type control. See details in log. Exception message: There is no Web named “/sitename/default.aspx”.. If I put the same control on the page twice, the first one errors and the second one displays correctly. Either there is something else I need to do to initiate it first, or there’s a bug in SharePoint – I did see some similar errors relating to hotfix 932621 that has similar symptoms – but I am running SP1 (no infrastructure update yet). Any ideas? Hi Rene, I am having problems with validation and I don’t seem to be able to find why. The required fields don’t seem to be recognised as missing by the IsValid functionality, but other validation e.g. text in a number field is working. Have you any idea why? What could I be doing wrong. I’ve had it working intermittently, but I can’t seem to spot what the problem is. Rene, (and anyone else who sees this) Worked out what my problem was. I was changing the content type at the same time as updating the fields – which means the mandatory validation works on the default content type. Not sure why other validation does work, but must just be a fluke. To make the validation work properly the item has to be the correct content type when you display the fields. I guess this does make some sense after spending ages working this out. Why not just use FieldRenderingControl? I don’t understand the requirement for this code…? Why not just use the control that is returned from the FieldRenderingControl property of an SPField object? Is there something I am missing? This always returns the correct control to use for the field. Your article is very enlightening as far as knowing which controls are used when. However I don’t think in real code you should try to guess which control to use if the sharepoint framework already does that for you. (Have I missed something here?). re: Why not just use FieldRenderingControl? I guess the question is if I missed something. I will look into this and do some testing. fyi – I have just done some limited testing for a web-part I am developing and this seems to work ok (only tested with a limited set of field types). When form is loaded and input fields are inserted and when i click savebutton it is not saving into my list. Does anyone has a clue? Cant seem to work for anonymous users..
what exactly does not work for anonymous users? thanks for the stuff your bringing in to the community..
anyway, when I put this code on an anonymous site, it prompts for authentication..
were you able to make this work anonymously before? the context is missing. You do not assign a context to the controls. Since you are opening a new site/web, I guess the controls need to know where they belong to. Unable to cast object of type ‘Microsoft.SharePoint.SPFieldComputed’ to type ‘Microsoft.SharePoint.SPFieldText’. Has anyone come across this, and, more importantly, has anyone solved this problem? I guess you will need to point the control to the list, item and field it should render. Try to set ListID, ItemID, FieldName and possible ControlMode. Excellent Post! I have got the fields to render on my page, but I missed something that tells me what I need to actually save the data. Could I just add a SaveButton control to the table and set it’s control mode to Edit? The problem seems to be that the GetSharePointControlValue function is failing. I have tried so many control collections but it does not find the controls on the page even though I see them. During debug I notice that it always fails to find the controls and I am not sure why. I did put the table in a panel. I am trying to see if I can loop through the controls collection to see what it does find. Update: Using the debugger in VS2008 I have found a problem that I can not figure out. I had my controls way down a control tree and have figured out where they are. However, when stepping through the code, it seems that the controls that hold the data are getting assigned a generic ID like “TextField”. This appears to be the reason that it can not find controls to get data from. I am not sure where the code is falling apart. I wrote a little function to loop through the table and there are controls that have the field names as assigned, but they do not seem to have data. If I return the .Value it is blank. If I return the ItemFieldValue it is not the value on the form, but the value from the list. Any thoughts?? When i remove the “Attachments” field from the default view the controls do not render the value in Display mode, they only render [“Coumn Name” Column Value]. It sounds bizarre, but this is what is happening on multiple enviornments. Appreciate if you could help me on this. Make sure you have all the references set, so the control “knows” where and what it should do. there was a bug in an previous version of my class. Use the latest, and the problem should be gone. I was published in my blog an new release of your code. If you have a custom field, when your code try to instantiate it, can’t find the assembly for render and generate an Exception. You can include a new funcion for load the assembly before their instantiation. Richtextfield displaying data as ‘[“Column Name” column value]’ instaed of field value in display mode. The validation doesn’t work. In previous comments they say that you have to use de default content type. But when I look at my list, it uses already the “item” content type. Do I have to change this? And where? I’m using a custom site column but I don’t think that is the problem. I am going insane with this! I did everything as what this post tell but not able to resolve the Display mode problem. I want to show fields from two lists into single webpart. Everything works fine in New/Edit mode but in display mode, fields shows [“Column Name” column value]. After adding AttachmentsField control for one list, display mode worked for that particular list only. For second list it still not showing correct values. Please help. I am using following code. I have a problem when adding control to my web-part. I have 2 web-parts in my solution. They used 1 list and change its items. Web-parts get list by url. When I deploy second web-part to another site, I can get list item, but I cannot add RichTextField control. If it is impossible to do like this. Is there any solution to edit items from another site??? @Totoy Bato Did you ever get it working with anonymous users? I have the same problem- adding the RenderingContext and ItemContext didnt help. Works fine with authenticated users but prompts for login for anon even though anon access is set to everything on the site. if i want to add a new folder in another site and i am using the code above but it doesn’t work cause the item is null, so item.ID is also null? so any solution? Could you please give me an example of the “New” control mode code? I saw you used Edit/Display as the example and I can see there are differences among these modes. i’ve noticed checkboxes will cause the form to not work for anonymous users, it goes to a login page. all other controls are fine. if someone know why tickboxes, checkboxes don’t work, i’d love to know. Hello! Just in case, here http://dotnetfollower.com/wordpress/2010/12/sharepoint-get-spcontrolmode-which-is-associated-with-the-current-request/ is described how to get current control mode on aspx-page as earlier as possible. Have you tryed using sharepoint controls for new items? What ever I try in DisplayMode it always repeats the first item. If I turn it to EditMode it displays fine! Even in DisplayMode the ItemFieldValue property has the correct value but the rendered HTML always comes out wrong! Was anyone able to figure out the issue in Display Mode. Even i am getting the same issue where it repeats the first item. The ItemFieldValue is proper but the rendered html is always of the first item. Any help is much appreciated. Hi Bob, Vaibhav, Parwej, ram and somebody who named “Correcting of my post”!!! [“Column Title” column value] / [“Column Name” column value] ? I am trying to use RichTextField in my visual web part because it provides ribbon functionality to upload documents in the RichTextField control. Thank you so much. This is exactly what I needed! How can I add the new column in my page? ?